In December 2008, the firm announced the planned employee-led buyout. The deal called for the new owners to hold 51% of the new company with the remaining 49% being held by the Lehman estate. According to Randall Whitestone, a spokesman from Neuberger, more than 200 employees are included in that ownership group. The original buyer was a consortium of private equity funds. Bain et al bid $2.15 billion for Neuberger, but that deal became uncertain. NB management paid $922 million (a $1.2 billion discount) for a firm with $158 billion in assets under management. Neuberger management did the deal with no debt. Sweet! Winners include George Herbert Walker, Neuberger's CEO and cousin of ex-President George W. Bush. Lehman Private Equity has Jeb Bush as an adviser. Did Neuberger trade for Jeb before spinning off from Lehman's corpse? Financial Crisis Anniversaries: What to Buy? Stomping Out the People's Voice at the Fed? Uwe, Uwe! ESHI Gotta Go! CalPERS to Up Percent of Investments in PEU's? Insurance Companies Get TARP, Who's Next? 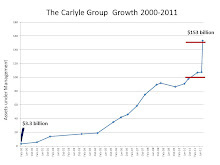 Carlyle Group's Rubenstein "Worst is Behind Us"
Carlyle Group: Too Big to Fail? Will Fed Issue Capital Calls?